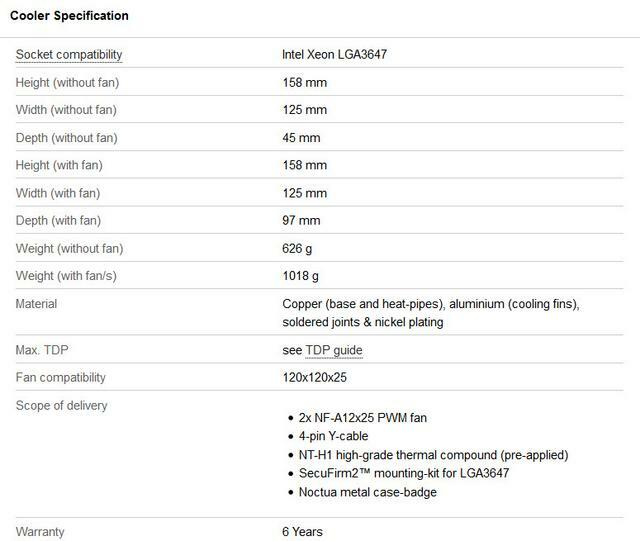 Intel's Skylake-SP-based Xeon Scalable CPUs (Platinum, Gold, Silver or Bronze, Purley series) and Xeon-Phi processors (code names Knight's Landing or Knight's Mill) processors use a new DX-3647 socket. In fact they are about 4x the size of Broadwell-D Xeons. Because of this, CPU cooling manufacturers who take cooling seriously are not just going to create a new mounting bracket and calling it a day. Those that are serious about cooling actually created a CPU cooler with a larger contact base as well. That is why Noctua has a new line of DX-3647 CPU coolers specifically for use with this new Intel CPU. Coming in 140, 120 and 92mm form factors respectively, the new NH-U14S DX-3647, NH-U12S DX-3647 and NH-D9 DX-3647 4U cover all bases from large, ultra-high performance workstations all the way to compact 4U size servers. Their designs also closely follow the designs of the NH-U14S, NH-U12S and NH-D9 original, but with a customized mounting base since these Xeon CPUs are quite large. Noctua didn't put much work into the package here. You can tell they haven't wasted any money at all on the packaging and frankly I think this is a good thing. The front of the box tells you the crucial thing you need to know, what the product is.Other than that the box is entirely blank, Noctua make an assumption that most people will be ordering this online and/or will know what it is before they buy it so therefore lavishly decorated packaging is just a bit gimmicky and not needed. Everything was packaged quite carefully and well protected. Open the main box and immediately you will see that the hardware accessories are packaged individually in a separate box. The cooler itself is packaged with the fan/s pre-installed. The accessories are clearly labeled with images depicting exactly what is inside. The heatsink's SecuFirm2 mounting system includes two sets of brackets in order to support both square and narrow-type LGA3647 sockets. The Noctua NH-U14S DX-3647 is a traditional single-tower-style heatsink. The heatpipes and base are out of nickel-plated copper while the fins are out of aluminum. The top view of the tower shows the termination points for the six nickel-plated copper heat pipes. Noctua's logo and name are embossed in each of the fins. This adds a nice visual touch, especially if you have a side window on your case. The fins in the array are slightly tapered inwards toward the center. Each of the six U-shaped, nickel-plated copper heat pipes pass through the aluminum fin array to deliver the best possible cooling performance. The heatpipes are connected to the fins well, with no visible gaps to be found. Some coolers have the heat pipes all in alignment with each other, but the heat pipes of the NH-U14S DX-3647 are staggered to maximize their exposure to the airflow. I've noticed that this staggered design method seems to yield the best cooling results. Here again I need to mention that a second fan can be installed easily, so if you like to go for a push-pull configuration and perhaps shave off another few degrees of your CPU core temperature. The heatpipes are positioned in eclipse type alignment rather than in a straight line, this is more noticeable when observing the heatsink from an aerial point of view. The nickel plated copper base is smooth with very fine machining marks that I have seen on each of the Noctua heat sinks I have looked at. So far this surface has not been an issue as far as cooling performance is concerned. At 70x56mm, the copper contact surface of the new DX coolers is more than double the size of the standard models. All three DX-3647 coolers come with NT-H1 thermal compound pre-applied, which ensures optimal bond-line thickness and saves precious time during installation. A Noctua cooler simply doesn't feel right without one of their beige and dark brown fans that look, well, unique would be a nice way to describe these. The NF-A15 PWM fan they used on this cooler spins at a maximum 1500 RPM. Integrated anti-vibration pads made from extra-soft silicone minimise the transmission of minute vibrations. As can be seen, Noctua utilized flow acceleration channels to improve overall performance while keeping noise to a minimum. Noctua's Stepped Inlet Design adds turbulence to the influx in order to facilitate the transition from laminar flow to turbulent flow, which reduces tonal intake noise, improves flow attachment and increases suction capacity, especially in space-restricted environments. With the tips of the fan blades ploughing through the boundary layer created by the Inner Surface Microstructures, flow separation from the suction side of the blades is significantly suppressed, which results in reduced blade passing noise and improved airflow and pressure efficiency. The NF-A15 features the further optimised second generation of Noctua's renowned, time-tested SSO bearing. With SSO2, the rear magnet is placed closer to the axis to provide even better stabilization, precision and durability. In order to guarantee the highest possible degree of manufacturing precision, minimum tolerance and excellent long-term stability, the NF-A15 PWM sports a CNC milled bearing shell made entirely from brass. The Noctua NH-U12S DX-3647 is a tower-style heat sink. The NH-U12S DX-3647 is symmetrical with grooves for fan clips on both sides. The top view of the tower shows the termination points for the five nickel-plated copper heat pipes. Noctua's logo and name are embossed in each of the fins and adds a nice touch if you have a case window. The heatsink fins utilize aluminum as its material due to its lightweight properties as juxtaposed to copper -- this is to allow the construction of larger heatsink's without stressing too much on the motherboard due to weight. The sides of the aluminum fins are folded flat to create better channels for airflow across the entire fin achieve better cooling performance and a more even airflow. Noctua's NH-U12S DX-3647 takes a hybrid approach in the heatsink fin leading edges compared to their previous designs. It still retains a low angle V-shaped slope towards the center,but includes bits of zigzag edges first seen in the NH-D14. By doing this, the company attempts to maximize its ability to permit airflow between the fins with minimal resistance and turbulence noise -- all with a negligible decrease in heatsink surface area. There are fifty aluminum plates on the radiator. The spacing is fairly tight. From my calculations, the total surface area of all the cooling fins combined is actually approximately 0.54 square meters, which is expected for a heatsink of this size. The heatpipes themselves are made from nickel-plated copper and feature a staggered arrangement to maximize the dissipation of heat throughout the fins. There are pre-installed mounting screws and included processor clips (square type and narrow type without Omni-Path fabric connector, with fabric connector on request), which make it easy to install. The CPU block is also made from nickel-plated copper and features a textured design to help improve surface area. If you look closely, you can see some of the wavy machining marks in the mounting surface. Thanks to its large surface area, the NH-U12S DX-3647 use dual fan configurations with two NF-A12x25 fans. It certainly wouldn't be a Noctua cooler without their unique fan color. I may not be a fan of it, but I always know a Noctua product when I see it just like everyone else. That fan color is simply unmistakable. 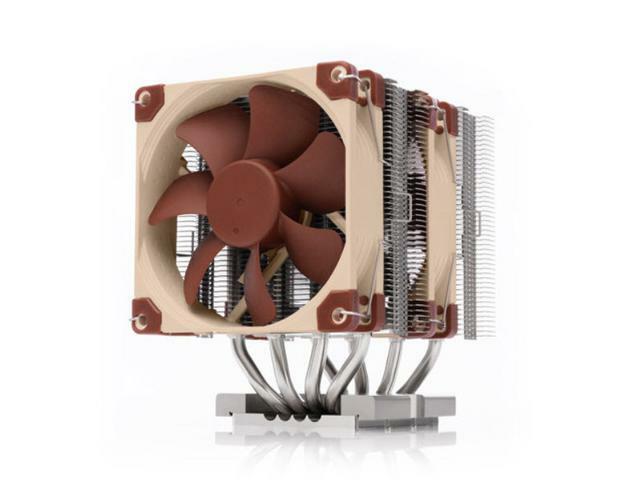 Noctua chose a PWM fan for the NH-U12S DX-3647. The included NF-A12x25 fans could be considered Noctua's secret weapon- just try finding SS02 bearings, AAO frames and Sterrox. Wait, Sterrox-what? It looks like a normal nine-bladed fan to me, why all the fancy words? In short, Noctua uses fancy words because there's some serious aerodynamic engineering behind the fan. It's worth it to take a moment and explain some of the features, because you'll quickly realize why Noctua has garnered such a reputation for their fans. First, the SSO2 bearing. SSO stands for self-stabilizing oil-pressure bearing. This bearing type combines an oil-based bearing that is stabilized by an additional magnet placed closer to the axis of the rotor. 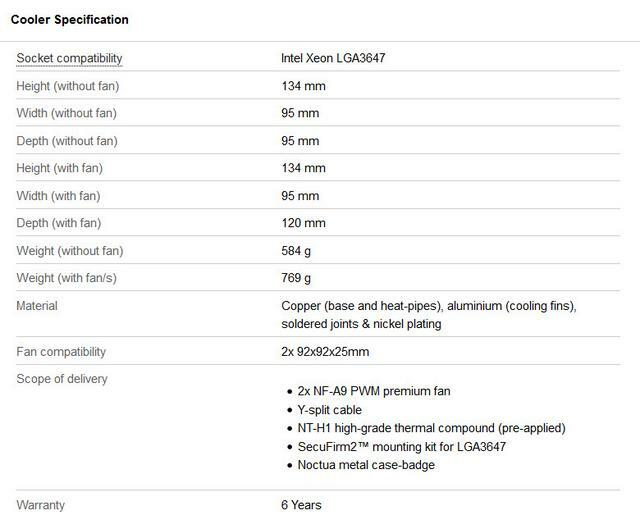 Not relying solely on the CNC milled brass bearing shell for stabilizing something that revolves 1,200 times per minute probably helps Noctua achieve a 150,000 hour MTBF for the fan, and that gets backed by a six year warranty, one of the longest I've seen in a rapidly evolving market like enthusiast hardware. AAO stands for Advanced Acoustic Optimization, and describes the features Noctua added to the frame to reduce vibration and increase efficiency with respect to noise. To do this, they've integrated (silicone, I'm assuming) anti-vibration pads on all corners (the NH-U12S DX-3647 comes with an additional, thicker set of pads that can be swapped out on a second fan in a pull configuration) and a series of steps or ridges along the intake rim to rough up the incoming airflow (the smooth intake flow of air will get mixed up anyway by the blade. Doing so a bit beforehand will reduce noise when that occurs). This Stepped Inlet Design has the side effect of increasing performance respective to a smooth curve when placed against an intake filter or other restriction. Noctua doesn't stop there with their acoustic optimization though, as the inner surface of the frame is filled with microstructures (It helps reduce the noise of the blades as they pass by while improving airflow. I'm assuming the effect might be similar to the use of dimples on a golf ball). The NF-A12x25 PWM doesn't stop there with the engineering. The NF-A12x25 has a record tight tip clearance (distance between the blade tips and the inside of the frame) of only 0.5mm. This highly ambitious design sets a new benchmark for 120mm fans and helps the NF-A12x25 to work more efficiently against back pressure, such as on heatsinks or radiators, by reducing leak flows through the gap between impeller and frame. The centrepiece of the NF-A12x25's motor hub is made entirely from steel and the axle mount is reinforced with an additional brass structure. In combination, both measures ensure ultimate precision and increased stability in the critical hub area. The NF-A12x25's impeller is made from Noctua's novel Sterrox liquid-crystal polymer (LCP) compound that features extreme tensile strength, an exceptionally low thermal expansion coefficient and damping characteristics that are ideal for reducing resonance and vibration phenomena in advanced fan-blade designs. Supporting fully automatic PWM speed control, the fan uses Noctua's custom-designed NE-FD1 PWM IC that integrates Smooth Commutation Drive (SCD) technology. By providing smoother torque impulses, SCD suppresses PWM switching noises and thus makes the fan quieter at low speeds. The latest version of Noctua's advanced Smooth Commutation Drive system ensures superb running smoothness by eliminating torque variations and switching noises. This makes the fan remarkably quiet even at very close distances. 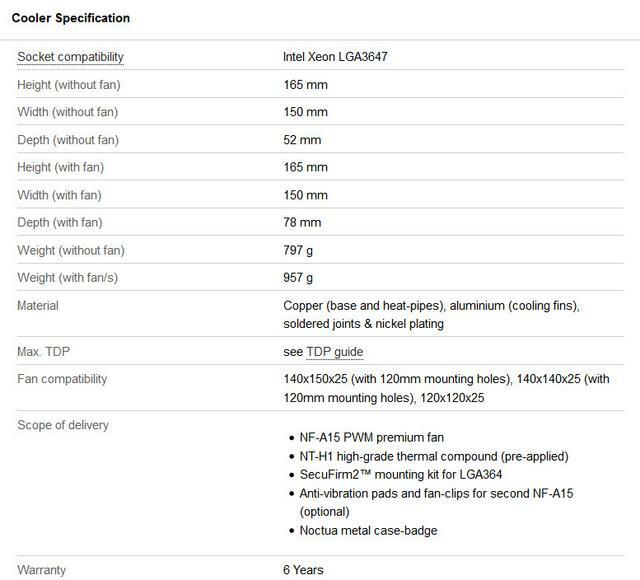 If you want to read even more about some of the technologies that go into Noctua's products, they have some extensive information available on their website along with some helpful diagrams that help explain some of their trademarked features. It features rotational speeds ranging from 450 to 2000 RPM. First impressions of the NH-D9 DX-3647 4U are very positive, it looks great and has a look and feel of great quality about it that is rare for a cooler of this size. It may be quite small, but overall it feels pretty heavy, no doubt due to those thick and plentiful heat pipes. The fans comes pre-installed, although it will need to be removed to fit the cooler to your motherboard. It's just put here to reduce the packaging size. It may be tiny, but the cooler uses a dual-tower design, with the sides of each tower partially closed to help better direct airflow through the fins, rather than losing it through the edges. 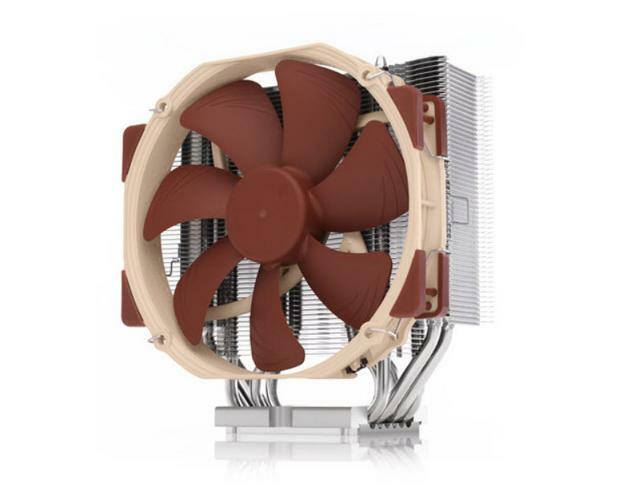 As for looks, Noctua has continued the trend of mixing tan, burgundy, and silver. The heatsink is completely silver, because of the material choices of aluminum and nickel plating around the entire unit. The fans are the tan and burgundy colors, which might clash with the gamer-centric flashy blue, or fire engine red, but it stands out for its non-conventional colors. Since Noctua has been doing it this way for so long, it at least gets brand recognition from any knowledgeable user. The fin stack is tightly packed and the individual fins are quite thick and strong compared to most coolers.There are also a few zigzagged teeth on both sides of the metal fin edges. Both of these optimize the ability to permit airflow in between the fins, while reducing the resistance and noise, all while only negligibly decreasing the heatsink surface area. As you see from the top, Noctua has implemented a hybrid approach in the leading edges of the heatsink fans. There is a slight V-shaped slope towards the middle on one side, and the other has a larger semi-circular cutout, so users can reach the installation screw. Noctua's logo of an owl can also be found engraved on top, which is a nice touch. The fans on the NH-D9 DX-3647 4U are very easy to remove. As it utilizes a similar system found in previous Noctua coolers, these wire clips are also very sturdy when mounted on the heatsink. It clips on the outside of the fan and goes around the sides of the heatsink fins. You can see these raised and ridged edges are integrated into the fin itself. Plastic clips are not required,just attach the wire clips directly to the fan. The wire clip retention length is also reduced to a balanced level, so attachment stability is not compromised. Thus, the fans are easier to remove with these tabs, and the clips can be removed uniformly. The wire clips also have an advantage by allowing users to be a bit more flexible in terms of the fan-heatsink location, but thankfully due to the small cooler, this should not be a huge deal. The fans themselves should not need to be removed, except for during installation as the single fan blocks one of the mounting screws. Despite its tiny size, the NH-D9 DX-3647 4U packs four copper heat-pipes to help move heat through to the aluminium cooling fins. The copper base plate and the heat pipes come with a gorgeous nickel playing and the CPU contact plate is polished to a mirror shine. At 70x56mm, the copper contact surface of the new DX-3647 coolers is more than double the size of the standard models. Tailored to fit the enormous integrated heat-spreaders of Intel's Xeon-based processors, this customised design allows for an optimal heat flow from the CPU over the base to the heatpipes and on to the cooling fins. The NH-D9 DX-3647 4U is equipped with two of Noctua's award-winning NF-A9 92mm fans in their high-speed 2500rpm HS-PWM variant. The 92mm fan has a Noctua specified rotational speed range of 400-2500 RPM, and an airflow rating of 96.3 cubic meters/hour. The included NA-YC1 Y-Cable make it possible to run two 4-pin PWM fans on a single fan header and to let the mainboard control the speed of both fans simultaneously. Integrated anti-vibration pads made from extra-soft silicone minimise the transmission of minute vibrations while maintaining full compatibility with all standard screws and other mounting systems.Rated mean time before failure is approximately 150000 hours, which is just over seventeen years. While you could find different fans to place on the heatsink, I would not recommend swapping out the Noctua fans, unless they produce a new set of 92mm units. Noctua has made great fans in the past, and I have no problem recommending these ones either. LGA 3647 socket is much larger and has a completely different cooler mounting. You cannot use any existing cooler with Xeon Gold/Platinum processors which have an IHS that is considerably bigger. First you must check if your motherboard uses square or narrow type socket(s). Here we see what is perhaps the most common LGA 3647 socket, the Narrow ILM version. These sockets take up a rather large area of the motherboard real estate. We find these sockets on both server and workstation motherboards. Next up, the Square ILM Socket. Here we see that the difference between the Narrow and Square sockets is the length of the socket. The square socket is useful when motherboard space is tight as it takes significantly less room. Use the included mounting tool and the short screws to install the appropriate brackets to the cooler. The LGA3647 platform uses a plastic clip that fixes the CPU to the heatsink and ensures that it is properly inserted into the socket. There are different clips for square and narrow type sockets. First select the clip that matches your socket type. Remove the plastic dust cover from the CPU socket and put the heatsink and CPU assembly onto the socket, aligning the CPU’s pin indicator with the pin indicator of the socket. Start fastening the heatsink to the socket by tightening the outer screws. Then tighten the two center screws, starting with the screw that is on the opposite side of pin. This design also helps with the installation of really tall memory modules. Phoronix Test Suite is run for 10 minutes and then the average maximum temperatures as recorded by CPU Temperature Monitor are noted.The average temperature across the cores is taken on our eight core processor. Celsius temperatures are used and i keep the ambient at 22 (+/- 1) degrees for all testing. Celsius temperatures should correct for any marginal ambient differences between 21-23 degrees. Acoustic measurements are taken 10cm horizontally away from the CPU cooler with the VGA fan disabled,hard drive in idle and power supply isolated. These are taken at desktop idle and AIDA64 load. The cooling performance tests are run at Stock settings. Each test is repeated 3 times with 3 remounts for consistency of results. Intel Xeon’s Silver processors certainly do not require liquid coolers to function properly at stock. As you can see, all good and fine really. I have put on the Dynatron B14 for comparison sake. Now let's have a look at the processor's LOAD temperatures (in the non-overclocked state). We measure in a 22 Degrees C ambient room temperature. Ambient temperatures do affect the cooling performance, albeit a little bit. We're already seeing a difference between the four coolers. 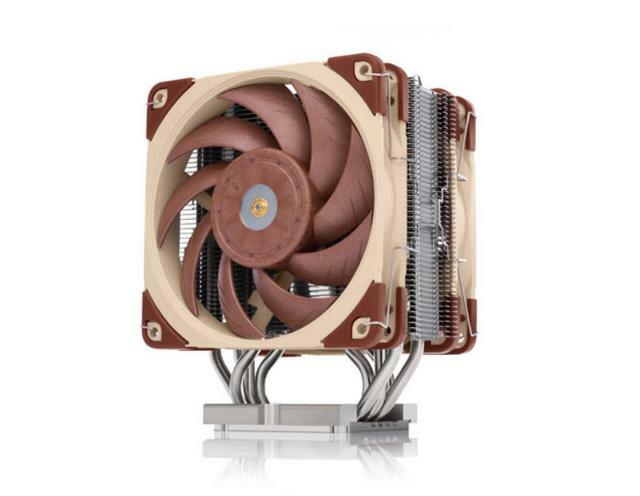 At all fan speeds, the larger model cooler from Noctua is around 12C cooler than Dynatron's Cpu Cooler. Overall fine results, remember this is a 8-core part here! At lower fan speeds, those coolers will be impossible to hear over other parts in the average user's case. Noctua NH-U14S DX-3647 and NH-U12S DX-3647 still does well at maximum fan speed. I would not call 46dB super quiet for the NH-D9 DX-3647, but considering there are two 92mm fan spinning at 2500 RPM in this test, you will be hard pressed to find another fan this size that can even come close. The three new coolers target specific application profiles. Whereas the 140mm size NH-U14S DX-3647 provides the highest level of cooling performance, which makes it ideal for top-end, enthusiast-grade LGA3647 systems, the dual 120mm size NH-U12S DX-3647 combines outstanding cooling performance with excellent compatibility: at 158mm height and 125mm width, it is short enough to fit most modern rack cases and stays clear of the top PCIe slot on most motherboards. Last but not least, the 92mm size NH-D9 DX-3647 4U with its height of only 134mm allows it to fit smaller cases and most 4U size rack-mount enclosures. 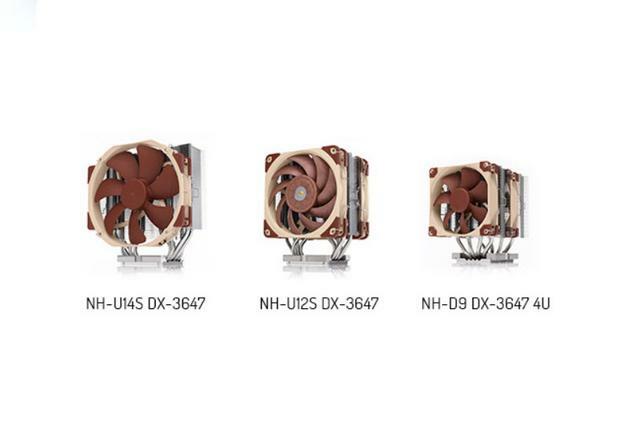 While the NH-U14S DX-3647 is supplied with one of Noctua’s premium-grade NF-A15 PWM fan, the NH-U12S DX-3647 and NH-D9 DX-3647 4U are equipped with two NF-A12 PWM 120mm and two NF-A9 HS-PWM 92mm fans respectively. This push/pull dual fan configuration allows them to achieve a level of cooling performance that is remarkable and comes close to bigger Coolers. As a purveyor of low-noise, high-performance cooling solutions, Noctua take noise seriously and does everything it can to keep noise levels low. At maximum RPM, the fans are rated at 40-46 dBA – not loud by any stretch of the imagination and inaudible from three feet away when locked in a chassis. At lower fan speed they are generate 35-38 dBA and the fans are dead silent for all intents and purposes. Unboxing a Noctua product is one of the truly great treats in the reviewers world. There's a real sense of quality and class from the outset, and although the inner boxing is brown card, even its thin sturdiness belies quality and simplicity rather than cheap and cheerful. A second long thin box contains the accessories, an Y splitter, an additional set of fan clips, a set of thicker rubber fan spacers, and even a mounting tool. All that's missing is the cuddly toy. Unlike the previous CPU socket with dual latches (LGA 2011) or single latches (LGA115x/LGA775) that we’ve already accustomed to, the LGA 3647 socket has a rather complex steps for heat sink installation, as doesn’t comes with any latches and the CPU heat sink are secured to the socket directly with screws. The cooler's SecuFirm2 mounting system for square or narrow type socket(s) has been completely custom-designed for the new sockets and is particularly easy to install: put on the heatsink, fix the four spring-loaded screws and you’re done! As previously mentioned the addition of the second fan on NH-U14S DX-3647 is a matter of personal preference between sound and temperature but the option is always something you like to see in a tower cooler. Last edited by testman78; 07-18-2018 at 06:07 AM.